Mimi is six years old. She is a lovely girl and likes to smile. She likes to play with various toys, and especially likes to play house, where she can feed a baby doll. She likes to communicate with other children during activities. Sometimes she can not express her ideas, but she likes to interact with her teacher. 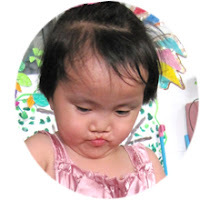 Mimi's cleft lip and palate have been surgically repaired. She likes all kinds of activities,especially singing. She is somewhat behind other kids her age, but she is catching up the best she can. Mimi can be adopted by married couples or single moms. Email mary.house@childrenshope.net for more information. Watch Mimi's video now and hear her little song. Greetings from CHIF-India Branch. I take this opportunity to thank you so much for your donation. 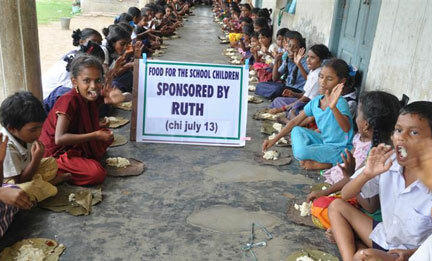 Your donation was used today to provide food to 135 school children. All the children were so very happy for the food they received. All the children prayed for you by your name. Thank you so much fro your compassionate donation which is a great blessing to the children here in our rural area school. We have started and running free schools where the children are receiving free education. Presently, in all our schools, more than 6000 children are receiving free education. As and when we receive donation from the kind people like you, we are conducting food programs in our free schools. All these children are from low income groups, backward class families, Homeless families, untouchable families and their parents are not able to provide sufficient food for these children. This is due to their deep poverty. Thank you for your kindness. Please find that I am enclosing some photographs of this food program. CHI adoptive mom Bonita Lim lives in Shanghai with her husband and two adopted special needs sons. Bonita is the founder of Brown Rice Designs, a fashion design company Bonita explains that "Some families in Shanghai do not have incomes enough for basic needs like housing, food, education, medical expenses and heating. Brown Rice's main purpose is to provide opportunity, independence and hope to those families that need it most.Brown Rice provides employment, microfinancing, equipment, training and support to people whose personal circumstances make it near impossible to otherwise work. Our Livelihood Program aims to enable individuals to become self sufficient businesses within two years. "When Bonita learned of Zhang Yali, a 13 year old girl whose destitute parents brought her to Beijing from their hometown in rural Hebei Province, she took action via Brown Rice. Yali suffers from leukemia, and the family didn’t have the money for medical care. Her case is not unusual in China, where funds for care of children suffering from birth defects and disease fall far short of the need. What is unusual is the story of how a good Samaritan who is a Shanghai businesswoman gave Zhang a new lease on life.